When you have to downsize, selling your house is usually not as difficult as dealing with your belongings. Likely your grown children are working full-time, running around to their kids activities and, bottomline, they do not want your items. Because ... well, they have a home full of stuff, too. Help is available through the National Association of Senior Move Managers (NASMM). This organization (which yours truly is a proud member) is dedicated to assisting older adults and families with the physical and emotional demands of downsizing, relocating, or modifying their homes. A Senior Move Manager understands the difficult experience of moving from a long-time residence and makes that move as stress-free as possible. You may have family member available to help you with your move. Fantastic! Beware of those deep family buttons that can be pushed, resulting in rising tensions and stress. Even if you have family or friends who are willing to help you, a Senior Move Manager possesses expertise and experience, providing you with economical and insightful solutions as well as connections to local resources to expedite your move. I always tell the family to blame me for all the decisions. That way peace can remain in the family. What is your plan to handle all your parent's stuff? Man, what a wonderful set of hot, steamly, beautiful summer days. My boys and I have been having so much fun enjoying life. Doesn't pay the bills, but hey, the experience is priceless. 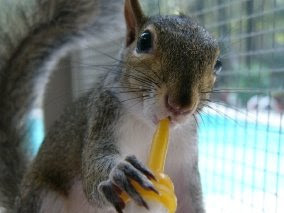 Sleeping in late, eating GIANT breakfasts, splashing in gramma's pool, seeing the latest movies and chillin' at home. Just introduced them to the classic: Ferris Bueller's Day Off. Slow down and take a moment. Make sure you are not missing a bit of life. What classic movie should kids see? Constantly questing for that perfect organizing product, only to get frustrated because it just doesn't seem to exist? 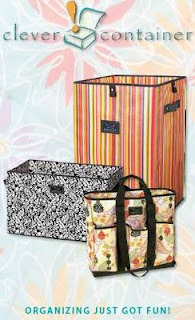 Now by having pretty boxes, bins and bags you will not magically become organized. Though, Clever Container offers you some unique and wonderful items to help maintain your new found organized home. Organized Solutions is excited to announce a partnership with Clever Container to provide you unique organizing products. The items are of exceptional quality and the prices are very reasonable. If you need more information about anything you see or wish to host your own Clever Container social, contact me for more details. What's your favorite Clever Container item? Moving is an exciting and stressful time. It will be compounded if you have not even finished unpacking from a previous move. 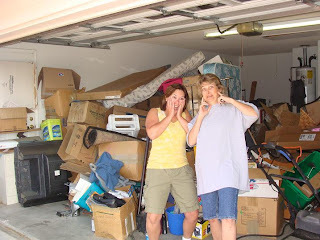 Knowing they were going to be in this home temporarily, Soul and her family never sorted through all the boxes stacked in their garage. On top of those boxes, were more boxes and items tossed adding to the pile of stuff. 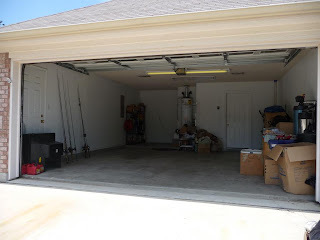 Their fishing gear was scattered about the perimeter of the piles which left them climbing over items to get in and out of the garage. With the Soul family frustrations rising, time had come to purge. Plus with a new home in the very near future, something had to be done. They have a storage unit where they keep their bass boat. The game plan we came up with was to sort through the boxes: keep, donate/curb, storage and trash. Keep items were mainly fishing gear, tools and garden stuff. Donate/curb items were things the family knew they would not need, but others could use. We had a couple mattresses, chairs, dresser, books, etc. These items quickly disappeared as we worked. Storage items were mainly boxes that had not been opened from the previous move because they were waiting to get into their permanent home. Trash ... big pile of papers, torn boxes and broken items. Ideally, The Soul family wanted their boat in the garage for easy access. So, we swapped and transferred the storage boxes into the storage unit and the boat came home. As the Soul family packs up for their final move,they can add those boxes to the storage unit. On the big move day, the Soul family will have a much smaller number of the time consuming boxes to shift and can focus getting their furniture situated and slowly bring in boxes to unpack in their new home. A project that would have taken days for the Soul family to complete, began at 9am and finished before 2pm -- under 5 hours!! 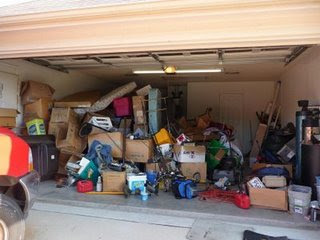 Since Soulman was focused on hauling the storage boxes, he has a few to sort in the garage yet. Though he'll get them done before the move date. We conquered this "garage from hell," as Soul called it. The Soul family is ready for their boat to come home and start packing for their final move. Completing this project will make moving into their new home sooo much easier. I am thankful I was able to help the Soul family with this organizing adventure to Dallas, Texas. Heading to Dallas to help Soul get organized and ready for a move. We will be focusing on her garage, though I have a sneaking suspicion that there will be a bit of fishing and much laughter, too. Where has been your longest adventure? jabs its way right into your finger. If you're lucky, you can pluck that bad boy out quickly. Aaaahh, instant relief. Amazing how such a small innocent item can reek havoc on your whole body. If you are not able to get your splinter out, your finger will T-H-R-O-B all day long. Bottom line: GET IT OUT and you will feel better. What does a splinter and Preparation H have to do with organizing? Look around your home. I bet big money that there is at least one item that you are keeping because your mom/daughter/friend gave you and you don't even like it. Yet, there it is in your big beautiful home. This corncob riding cowgirl figurine has been in your home for years. You look at it every day. You move it to another spot, but it doesn't help. "I wish I could get rid of it, but I don't want to hurt ___'s feelings." Time to get that splinter of a corncob out of your home! Likely the person who gave it to you, will not be offended. They probably don't even think about that gift any longer. And if they are upset, well, they're just not that great of a friend to begin with. Guarantee that by removing that one item from your home you will feel a sense of relief, just as you do when you slide that tiniest piece of wood out of your finger. What splinter is in your home? that wasn't a bill, notice or sales advertisement? written with the intent of caring or gratitude. 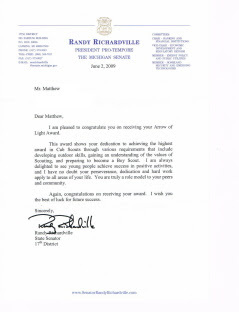 Michigan State Senator, Randy Richardville, took the time to write Matthew this letter acknowledging his recent achievement in receiving the Arrow of Light in Scouting. Mr. Richardville must have read about it in our local paper. Matthew said he had no idea what to expect as he opened the letter in front of his school classmates. Then he read it and everyone cheered! Thank you Mr. Richardville for creating an amazing memory for my son. I will remember the joy and pride on his face forever. Who are you writing a note to today? All great companies listen to their customers wants and desires to create better products and services. Rubbermaid has taking food storage containers to a new level by doing just that. Rubbermaid's new food storage products ... well, they ROCK! Easy Find Lids - Hallelujah! Finally no more will plastic containers forever be parted with their matching lid because these lids snap to the bottom of the containers or can all be stacked together as a happy family. Premier - Easy to seal. Easy to clean. Easy to store. The storing part I LOVE! The lids snap to the bottom of each container or you can stack all the lids together. Plus, the containers all nest into each other. YEAH!! I also performed an impromptu drop test as my homemade salsa came "flying" out of my fridge and hit the floor. Terrified to look down, I was shocked to see my salsa safely secure inside my premier container. Joy. Produce Saver - Being a single chick, my produce tends to turn south before I can munch it all up. Thank you Rubbermaid for your Produce Saver line! It's green which is just a happy color. Bonus, my fruits & veggies last much longer and still crispy fresh. The tray snaps to the lid, and the lid snap to the bottom of the container. yeah, everything is together. LOVE IT!! Lock-Its - For the extra security of 4 locking tabs on the lid with a rubberized seal, nothing is going to get out of these bad boys. Perfect for taking your favorite soup into work for lunch or storing your make-up items in the bottom of your gym bag. The lids will not pop off. ... yes, the lids snap to the bases, so organizing is a snap. Happiness. All these Rubbermaid products are dishwasher, microwave and freezer safe. Plus they all nest together. No longer must you tear apart your kitchen to finding matching lids and bowls. Thank you Rubbermaid for making organizing easier. All with the lifetime guarantee, too. What company is doing something right? Feeling like Buster Douglas up against Mike Tyson. Not looking for a championship, just fairness. Music is how I pump up and get ready for everything. Today, I choose Eminem, "Lose Yourself." What is your rally song?